Praxis: Coimbra's Microbrewery — Nom Voyage! While family was visiting, we took them to a place we'd been wanting to try for awhile: Coimbra's (maybe) only public microbrewery, Praxis. I say "maybe" because it's highly possible there could be another place we just haven't found yet; Coimbra has surprises for me all the time. Praxis' tasting room is also a restaurant, so we decided to go for dinner as well as drinks. Parking was a little confusing - we never found their lot and ended up parking in front of an apartment building. Once inside, between the four of us, we tried the weiss, pilsner, amber and dunkel. They were all a refreshing change from the usual omnipresent Sagres and Super Bock. Nothing against the latter two - they're great on a hot summer's day - but there are times when your taste buds just want something a little different. I had steamed clams with herbs and lime in a buttery sauce (€14) and everyone else had Francesinhas (€9). 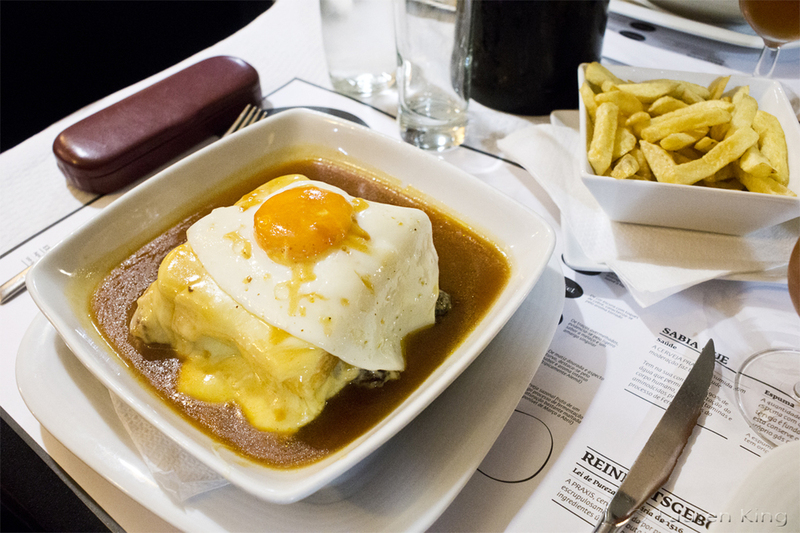 The Francesinha is a baked sandwich filled with 3 or 4 different types of pork and topped with melted cheese, a very mildly spicy sauce, and a sunny side up egg. It comes with a side of fries which can be sized anywhere between manageable and fast food super size. It's said that the recipe for the Francesinha originated in Porto, but good versions of this sandwich can be found throughout Portugal. I would definitely go back to Praxis again - the food was good, albeit a bit pricey compared to most other local places. Hopefully they let you buy and refill growlers - I didn't check, but I'd love to take a jug of the weiss beer home.